When we discuss diamonds, we’ll often talk about the crown or the pavilion, but we rarely mention the girdle. This article is going to explore what a girdle is, and whether to go for frosted or polished? The girdle is the thin rim that joins the crown and the pavilion, and which extends around the entire circumference of any cut diamond, regardless of the actual type of cut. Although nominally “straight”, in that the rim itself doesn’t rise or fall into either crown or pavilion, but maintains a consistent border between the two, it isn’t a uniform height all the way around. 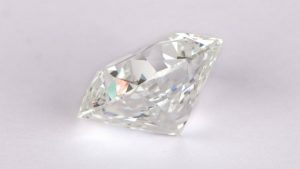 Because of the facets of the crown (top section of the diamond) and pavilion (bottom section of the diamond), or even when cut into the girdle itself, it has hills and valleys where some parts are wider, and some narrower. This isn’t always apparent at first look, as the crown undoubtedly takes center stage and the majority of attention, but is easily seen when examined closely. Because the girdle is the thinnest and most exposed part of any cut diamond, it is this which is commonly the victim of any chipping that results if the diamond takes a significant knock. Officially, girdles are graded on a scale from Extremely Thin to Extremely Thin, with the middling Thin, Medium and Slightly Thick classifications being considered most desirable, but there are other aspects to a girdle, not least whether it should be polished or not. There is no right answer to this question, at least in most cases, although it is true that some diamonds will benefit from a frosted girdle where others would suffer greatly. If a diamond has any hint of color, especially when we get past yellow and into the brown part of the color wheel, then a frosted girdle – often referred to as bruted – can appear almost dirty in the wrong light, as any light entering and the crown is stopped from leaving through the girdle, causing an effective dark spot in the refractive and reflective properties of the cut. However, if a diamond is at the higher end of color, it’s whiteness can often leave a stone looking a little too clinical. In such cases a thin frosted girdle can add character and life that is otherwise missing. 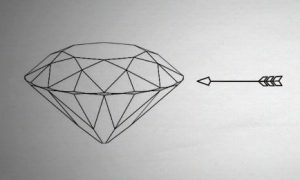 It also depends on the cut and how the diamond will be set. In particularly delicate settings, a frosted girdle can provide extra grip to prevent loss, although extra care is usually required to prevent the lack of polishing from detracting from the overall standard of the diamond from an aesthetic point of view. 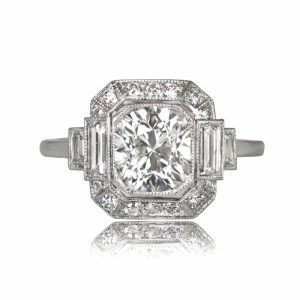 Another consideration for those who prefer antique diamonds, is authenticity. Any diamond that was cut over 60 years ago will not have a polished girdle. If someone wants their antique diamond to feel genuine, they will likely want to keep a frosted girdle. With diamonds produced in recent years, frosted girdles are less common than they might have been 30 or 40 years ago, with most cutters preferring to “finish” the cut properly. Perhaps surprisingly, whether frosted or polished, the girdle itself will rarely affect the value of a diamond, with the cut quality of the overall girdle itself being considered much more important. Now, with highly accurate machine and laser cutters, producing a high quality girdle is much simpler than previously, and polishing is now the logical conclusion to the production process. All things being equal, the thinner the girdle, the less need there is for it to be polished and then faceted. It may be that most finished ring purchases are made without the girdle even being noticed, but that doesn’t mean it is okay to ignore it. Check the thickness, and check the finish. If you don’t like what you see, walk away.